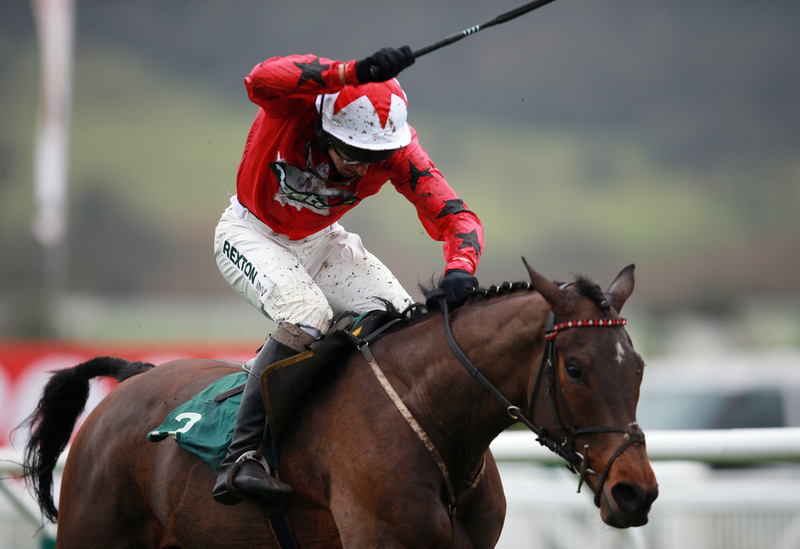 To kick off our big priced e/w lucky 15 we head to Aintree for the first Grand National trial of the season and we've gone for a horse who is well familiar with the national course and the national itself and that is the Nigel Twiston- Davies trained BLAKLION. Winner of this race last year off a mark of 153, he will go to post this year off a mark of 158, just 5lbs heavier. 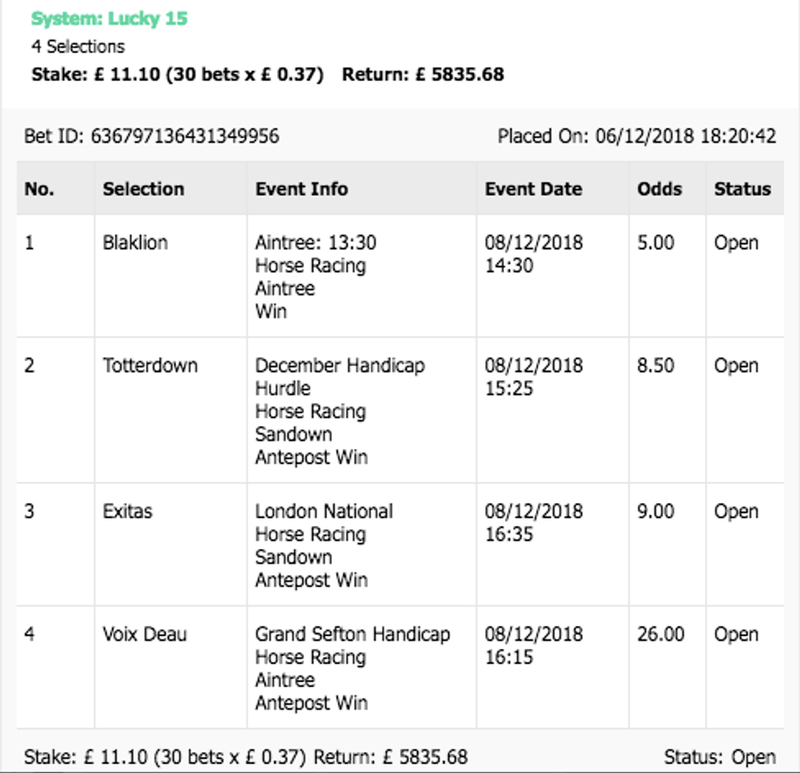 After going off at a healthy price of 14/1, he was dramatically brought down early on in the Grand National and then followed that up with a disappointing appearance at Sandown. He's not been seen since that race in April but now fresh and on what looks to be his favoured heavy ground, at odds of around 5/1 he looks a safe each way price to say the least. In what looks to be a wide open handicap, we're really taking a liking to the Richard Phillips trained TOTTERDOWN. From a stable with only five currently active horses, Totterdown looks to be the best of the lot and he backed those claims up last time out when claiming an emphatic six length victory over C&D. This horse is already three races into the season and with many of the favourites in this race yet to run, his recent racecourse experiences could well be the defining factor in him getting up for the victory on the day. The heavy rain forecasted for Sandown over the next couple of days will also help him massively and he looks potentially well overpriced at 15/2. In his second run for new trainer Lucinda Russell, VOIX D'EAU is a horse who looks well capable of defying the massive 25/1 odds currently on him. After a busy summer which saw him run seven times claiming two victories in the process, he moved up north from Harry Fry's yard to Lucinda Russell's where much is been expected of him. Russell's elite are notorious for loving the heavy ground and with the forecast at Aintree once again looking bleak, this will more than likely play into Voix's favour if he's already captured the heavy loving vibe. Despite finishing a disappointing 20 lengths seventh behind Frodon on his first run for his new yard, we firmly believe he'll right all of his wrongs and at least get a place this Saturday. Our final selection for our Saturday E/W Lucky comes in the form of the Phil Middleton trained gelding EXITAS. Another horse out of a small stable, he's failed to finish outside of the top four in his last nine races, some form coming into arguably the biggest race of his season. His season so far peaked with an 11 length victory over the aptly named Beat That at Aintree in October but the form was then reversed at Warwick a month later. Still looking capable of a big run, he may well cause a surprise at odds of around 8/1.